I am so happy to bring you this design just in time for the coming weather. 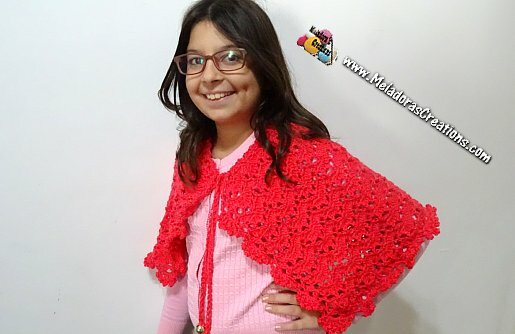 Now that our kids have gone back to school, we need to start preparing for the chilly weather that we know is coming and that means making crocheted items for our loved ones. 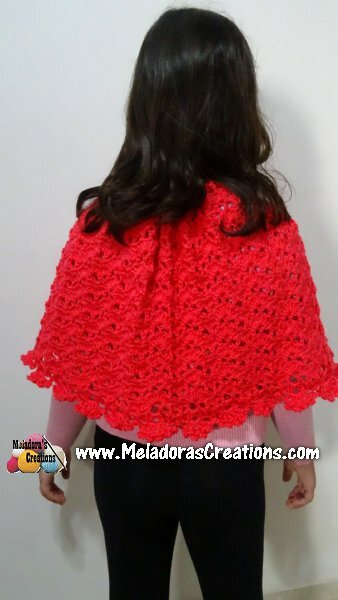 230 meter \ 251 feet – 100 gram skeins – I used 2 skeins on this cape. But it was tight! To be sure I recommend getting 3 skeins of your desired color. 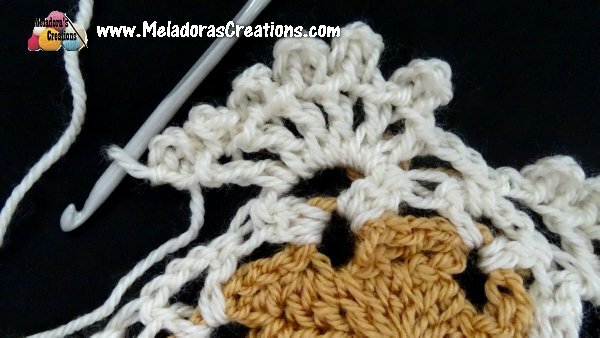 DC dec – If you don’t know how to a Double Crochet Decrease – YO, insert your hook into space, pull up a loop, YO and pull through only 2 loops, repeat this one more time. Now you have 2 incomplete dc’s on your hook. Pull through all 3 loops. 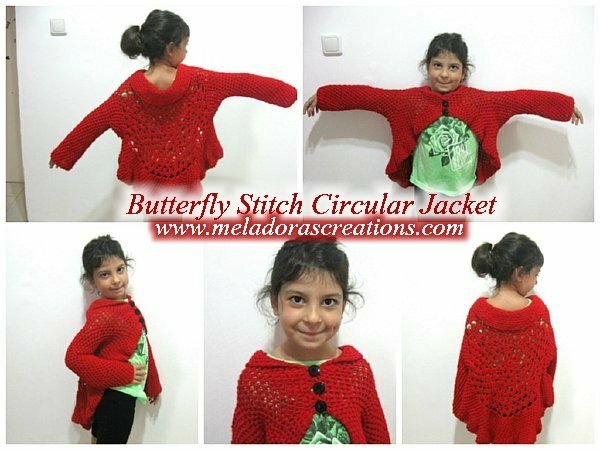 It’s hard to believe she’s already outgrown her Butterfly Stitch Jacket I made for her. 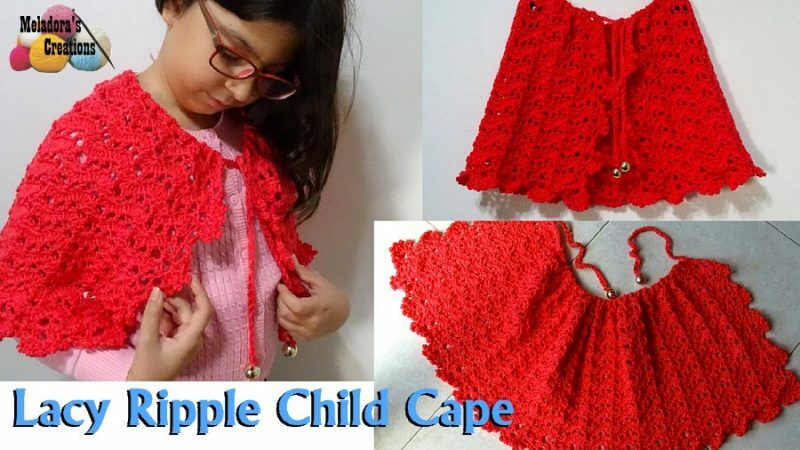 But my little girl is growing up and has made a request for a new item to keep her arms, shoulders and back warm during those chilly mornings. So we went to the yarn store together and she choose the color yarn she wanted and picked out the stitch she wanted me to use and I went to designing! This is what I came up with. She’s very happy with it and I’m very happy with the way it came out too! Was super easy too! 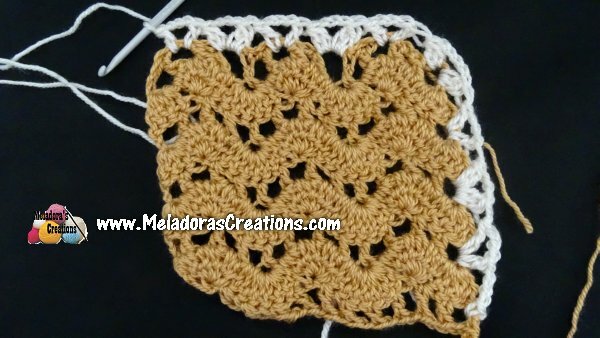 If you learn better by watching, then you can find out how to do this stitch here Lacy Ripple Stitch #3 If you want to make it bigger or smaller then you can. 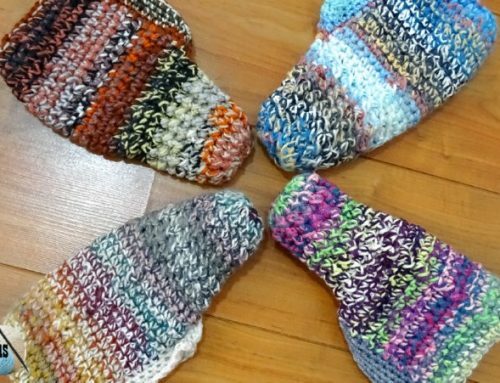 The multiples of this stitch are 8 + 7. Repeat for row. Ch 3 and turn. DC 3 in 1st DC of row. * DC dec using the next 7 ch 1 spaces and DC’s. Pull through all 8 loops on your hook and ch 1, DC 7 into next DC. * Repeat for row. DC 4 into last DC of row. Ch 3 and turn. 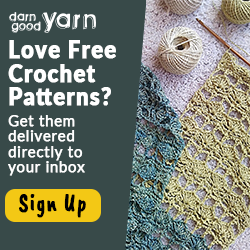 NOTE – The first ch 1 that you will use is hard to see, but it’s pretty much the same stitch you DC 3 in. Just remember when decreasing you will begin and end your gathering in a ch 1 space. The ch 3 counts as first st. Sk next st and DC in next dc, ch 1 and *Skipping over the next DC and the small stitch where you closed you DC dec… DC into stitch next DC. Ch 1 and skip a DC, DC into next and ch 1. Sk a st and DC into next, (should be the top of the shell) ch 1 and sk a st. Dc in last dc of shell. Ch 1. * Repeat for row. DC in top of ending ch 3 to end the row. Ch 3 and turn. I did a total of 21 rows. You will need an odd number of rows for the border, also ending after a DC ch 1 row because we will be using those spaces to weave our tie. I did 80 SCFS. Be sure to leave a tail at the beginning before your slip knot and at the end of the row. I found an old rubber band that had 2 metals balls attached to them. I’m talking old school rubber bands, though I’m sure just anything with holes in it can be used. I threaded them with the tails on the end and tied them. 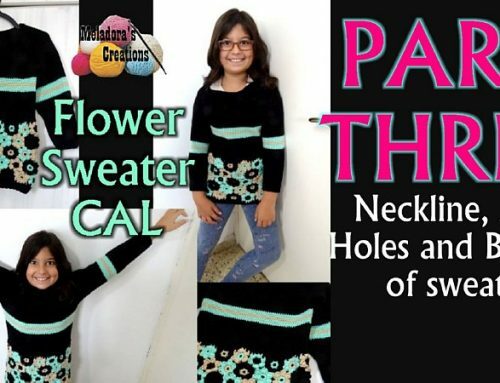 Attach your yarn on the Left side stitch of your piece, with the BACK \ Wrong side facing you. DC dec, ch 3, dc dec into the next ch 3 space. 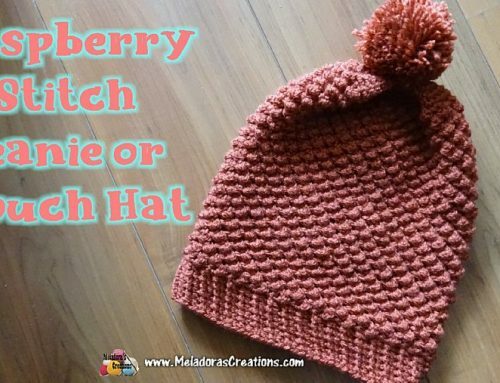 This is what I will refer to in this pattern as the DC dec V stitch. Repeat until you reach your first corner. 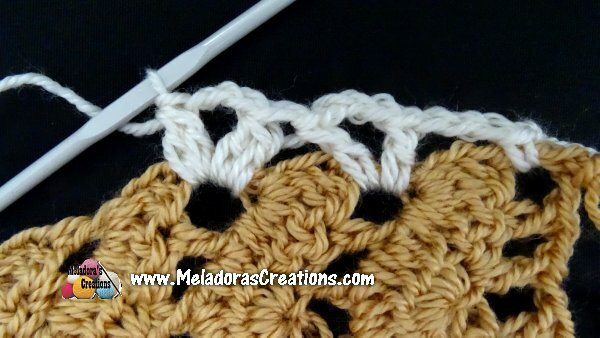 By the time you’ve reached the corner you should have just finished a V stitch and are ready to do the DC dec V stitch, if not I recommend backing up and restarting so that it does, if not your corners won’t come out looking right. DC dec, ch 5, DC dec all in corner ch space. Then continue working your stitches as before. Next space will be a DC V stitch. 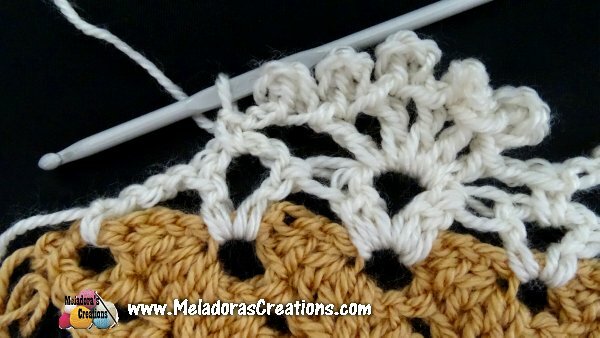 You will end your row on the same stitch as you began it on the other side, by chaining 3 and sl stitching into it. Do the other corner as you did before and carry up the other side as well. Once you have 3 sides done, then Ch 2 and sl st in last space to end row. 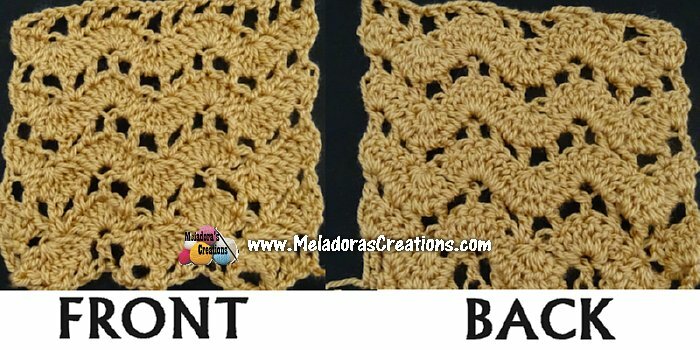 If you need more help doing this border, I show the whole thing on video in the tutorial. Ch 1 and turn. Sl st into the Ch 3, now ch 3 and we’ll be crocheting into the ch 3 that’s in between your DC dec V stitch. 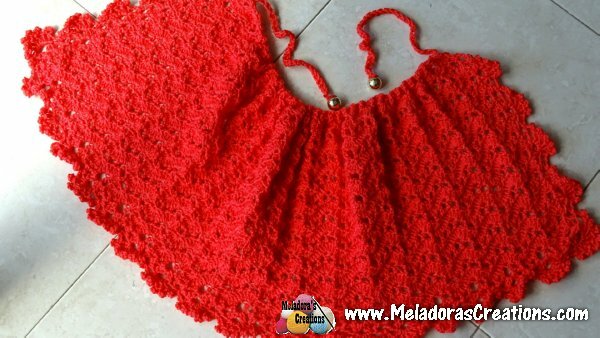 *| DC and ch 5, sl st in first ch to create your picot. | repeat 4 more times until you have 5 total DC & picots. Ch 2 and sc into the ch 3 space of your next DC V stitch. CH 2 * Repeat until you reach the corner. 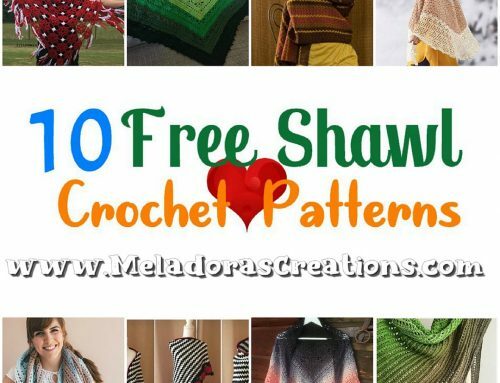 On the corners you will work 7 DC & picot stitches. Then ch 2 and sc into the ch 3 space of your next DC V stitch. Continue the pattern until your reach the last st of row which should be a regular DC V St. Just ch 2 and sl st to end row.